Miuccia Prada was not present at the showing of her Spring/Summer 16 womenswear collection in Milan – and yet her presence could be felt everywhere. 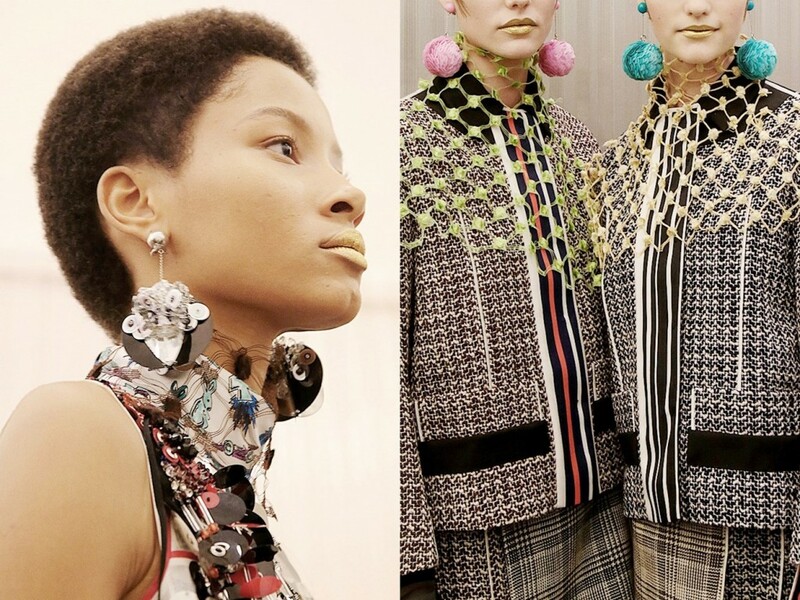 It was a Prada collection and show par excellence – both strangely familiar yet strangely strange. In OMA’s floating set, suspended sheets of curved and corrugated fibre glass and plastic were a ghostly mimic for a rougher, metal, real world version of events. So too were the clothes, where the bourgeois tweed suit became almost a delicate apparition, reworked in transparencies, sometimes intercut with aprons of original, traditional tweed. Then time would almost be literally sliced, in clothing made from strips of fabric in patent leather, fur, or the finest couture fabrics. Were these 20s Art Deco stripes? 60s youthquake signifiers? Signs of the sportswear of now? Or was this simply something of the future built on the many iterations of the past? “’Who is this woman who wears a suit? Is it too old? Is it wrong?’ Very often she likes to hate things. She hates things so much it suddenly becomes what she likes!” So says Fabio Zambernardi, of Miuccia Prada’s spin on the Socratic Method that is her design process. In the world of Prada, perfection is paramount, but this is a perfection that is not easily won: even wrongness has to be absolutely right. In the latest collection such wrongness of colouration was everywhere present, but particularly in the home-style domesticity of the knitted sweaters layered under elegant flapper dresses, or the ornately embroidered suiting of the finale. A touch of childlike domestic glee that could also be found in the key print of the show, again layered under elegant suiting or dresses, yet looking like a child’s bedspread or wallpaper. Here the details are a race car, a rabbit and a rocket – Miuccia Prada’s eldest son is a race car driver, the rabbit is for luck and the rocket for the future. Such autobiographical signs and symbols of Miuccia Prada can be found everywhere in the collection, as they can be in all of Pradaland – including one of its newest attractions: Fondazione Prada. On the outskirts of Milan, towards Linate Airport, lies the Prada Foundation. In a former industrial complex – a distillery dating back to the 1910s – Rem Koolhaas’ OMA has designed a home for the Prada Foundation and an art collection as idiosyncratic and personal as the S/S16 show. While other corporations present a fundamentally idealised, power view of themselves through art acquisitions to the outside world, Prada’s is distinctly different. Weird, domestic, warm and witty – while at the same time displaying impeccable personal taste – it is perhaps the most revealing corporate art collection in the world; so wrong at projecting power, it’s absolutely right. Full of blind alleys, staircases to nowhere, nooks and crannies, it is almost as if the art is happened upon by accident at times in this diverse complex of buildings, giving the distinct feeling that you are exploring somebody else’s world, with particular clues to who these people actually are. And, quite frankly, they are mad people – in the best possible way. Less concerned with an ostentatious display of cold, blank power and more with a funfair flair for aesthetics as entertainment, the complex is dominated by a golden tower, only accessible at set times for restricted numbers, called the Haunted House. The Haunted House is home to a Louise Bourgeois installation from 1996 called Cell (Clothes). With traces of the artist’s life through clothing – from ghostly children’s clothes to elegant, grown-up eveningwear – it is perhaps the clearest link in spirit to the present Prada collection: an oddly moving, mixed media biography. Downstairs, in one of the adjacent gallery buildings, is another clue to the present collection. In David Hockney’s Great Pyramid at Giza with Broken Head from Thebes (1963) is a figure seemingly wearing a coat from the show: a gold and green striped tunic, not unlike model Molly Bair’s look. In the Prada Foundation it is clearer than ever that Miuccia Prada is one of the great ‘brand auteurs’ and a ‘fashion imagineer.’ If any designer is making pop art today – and at this point it makes far more sense for it to occur in the realm of fashion than fine art – it could be credited to Miuccia Prada. With her synthesis of high and low, her unashamed embracing of the consumer experience mixed with a little bit of poisonous doubt in the sugar-candy desirability of her clothing, this commercial, self-referential form of pop becomes post-pop, and she is the Disney queen of it.